On day nine of handler training, I went to work with Savannah at the Cheesecake Factory. This was a bit more formal than the Panera Bread. We met up with another handler in training and her new seizure alert dog Bud, who is a black lab like Dyson (but bigger). Savannah also brought a yellow lab named Vince who is a Little Angels dog in training. Bud and Dyson went under the table. They were friends during training at the ranch and happy nuzzled and kissed during lunch. Bud doesn’t wear the mobility harness with the handle; he wears a smaller blue vest. Dyson has that kind of vest too but usually we use the mobility one. During the meal, the other handler and I got to ask Savannah questions and bring up any concerns we had with our dogs’ behavior. The main issue Dyson had was that he still hadn’t pooped. Every night during training I also have homework, so Savannah went over the answers to some of the questions with us. The homework is to read a section of a given dog book every night and answer questions in a booklet. It helps us get tips on working with our dogs, and allows us to get alternate opinions on certain subjects since different trainers have varying ideas and favorite methods. I finished the first book earlier in the week. It was Good Owners, Great Dogs by Brian Kilcommons and Sarah Wilson. 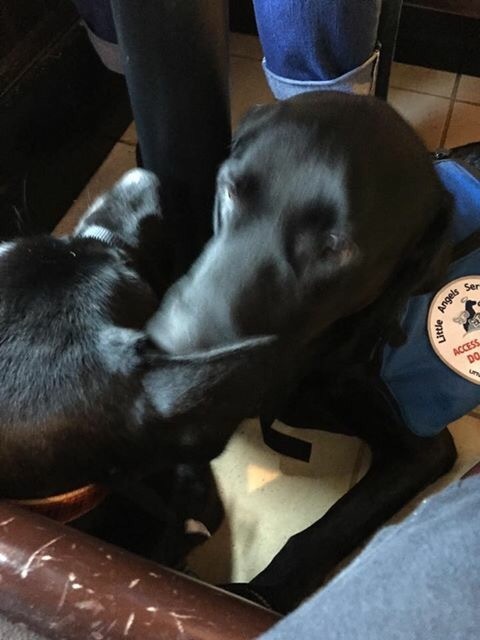 I then started the second book, A Guide to Training Your Own Seizure Assistance and Alert Dog, written by the director of Little Angels Service Dogs, Katie Gonzalez. I feel lucky to be working with such an amazing trainer.